It's that time of year where we heat up hot chocolate, turn on our favorite fall shows and curl up next to the fireplace. 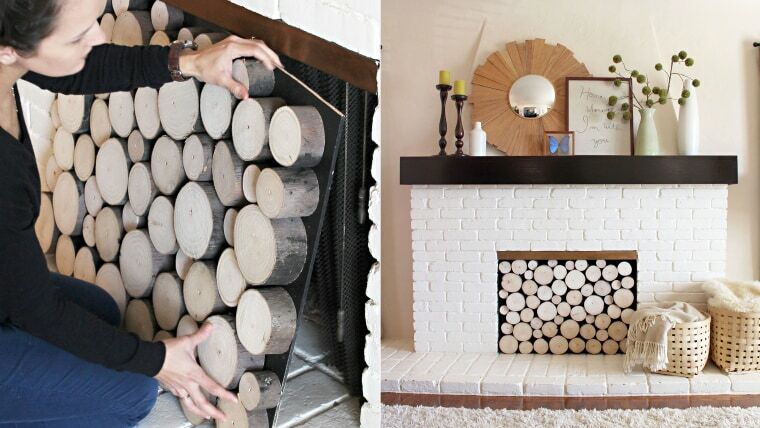 But what if your fireplace is an eyesore? Here are 4 DIY projects you can do this weekend to fix that. Sure, stonework can create a homey look, but if you want something more modern and bright, consider painting the area around your fireplace a fresh white, like Arizona-based interior designer Jenny Komenda did. "It was nothing more than brushing on a good coat of water-based primer," Komenda told TODAY.com. "I wanted bright white and the primer did a great job of covering the dark stone with only one coat." Find her tutorial for the DIY on her blog, Little Green Notebook. Give your fireplace a new look and add more storage buy creating your own built-in bookshelves, just as Jennifer Stagg, an interior designer, did in her Utah home. "The transformation was unbelievable," Stagg said about the project. "Not only is the room beautiful, but it's also more functional." Intimidated at the idea of creating your own built-in shelving unit? Stagg shows how it's done through video tutorials on her site, With Heart. A fireplace doesn't necessarily need a fire to make it eye catching, as design blogger Morgan Spenla proved with this DIY project. She created a faux-log look that she could remove when she wants to use the actual fireplace, then put back on once the fire is out. Learn how you can get the same look on Spenla's blog, Pepper Design Blog. Chalkboard paint is always a good idea, so why not add a few coats to the area around your fireplace? Write messages, pictures or add a faux-brick facade, as design blogger Carmel Phillips did here. "The great thing about chalkboard paint is that it's just paint," Phillips said. "It's a simple fix if I ever decide I'm tired of this look." See how she did the DIY on her blog, Our Fifth House.